Rachel Johnson is a Hollywood animator producing stop-motion films that fall decidedly outside the celebrity culture of her town. Her latest, Henrietta Bulkowski, is about a young woman with a severely curved spine who wants to see the world but can't even lift her head. With a sightline only of the ground, she builds a plane with a hole in the bottom to take her on her voyage. The Toll Collector (above) is about a ballerina with abnormally long legs. She dreams of being a dancer, but instead hides her physical difference by taking the night shift as a road toll collector. "As the film wrapped, I realized I had spent two years building and filming the most intimate secret I had," says Rachel, founder of Lift Animation. "My own shame." Rachel, who grew up with one leg four inches shorter than the other, had multiple operations as a teenager to break the bones in her short leg and stretch them with fixators over months in hopes of evening out her legs. But after years of complications that resulted in infections, accidental breaking of her bones and the need for reconstructive surgery, her leg was badly scarred and unusually shaped. And it would still be a bit shorter. Rachel had dreamed of leaving the hospital to become a ballet dancer. Instead, she resigned herself to wearing long pants and pretending she wasn't different. But the years of painful procedures came out in her dreams. "I had nightmares about the hospital and everything that had gone wrong and being disfigured." The only thing that eased the disturbing dreams was making art. "I didn't know what I wanted to do specifically, but it needed to start out undesirable so I could make it beautiful," she says. She began by making sculptures of overweight women. "My mom was always overweight and thought she was fat and ugly. I thought she was beautiful. My whole senior art show was beautifying overweight women. Other people thought they were really pretty and I realized I had the power to change the way people see things." She moved on to photography of seniors, and then stop-motion animation, creating tiny puppets from clay that are animated when still pictures of them making incremental movements are run as a sequence. "I've always wanted to sculpt realistic things with a twist," she says. Rachel is currently pitching a feature film with a non-verbal character. As she's been so successful in conveying the beauty and humanity of characters with physical differences, I wanted to know if she had considered a character with an intellectual disability. "I did a short film about a woman with Alzheimer's but I got a lot of flack for it," she says. "It was a total failure. As the protagonist of a feature your character has to go through a character arc, where they start one way and end a totally different way. The woman with Alzheimer's had no control over how she was going to end her life so it was hard to craft an arc. She was incapable of the change and growing and learning most people can relate to." Rachel says a child with intellectual disability would be an equally hard sell. Viewers "can't see the value of a person unless the person is in some way like them. If the character doesn't have the ability to change on a level that most people can relate to, they can't connect with the character. They don't get it." I'm interested in how we can change stereotypes about disabilities that are deeply embedded at an unconscious level: these are biases that underpin a culture and which we are all raised on. This gave me food for thought, listening to Rachel explain how the limits of narrative structure made it challenging to tell the story of a child with intellectual disability in a way that would have meaning for most people. "There isn't enough exposure," she said. "People don't understand empathy because they don't have to. One of my very best friends grew up very sheltered. Nothing ever happened in her life. She would ask me the most inane questions about my leg. Then she moved to Africa for a year and she lost 40 pounds because she was so heartbroken by the pain and poverty and she changed. She became an empathetic person. But you have to be 'out of the box' to get out. Most people aren't born with empathy." I hope Rachel takes on the challenge of creating characters from the most marginalized of populations, including mental disability, and showing us a different picture. 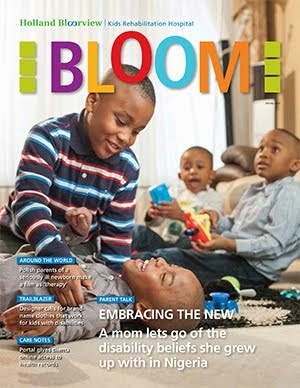 A longer interview with Rachel will appear in the December issue of BLOOM magazine. Love to see what she'll do with the nonverbal character!